If you want to get the Microsoft Kinect setup and working on your Mac using OS X 10.9 Mavericks, then you’ve come to the right place. Since posting the first tutorial, a number of new software updates have been released, so it’s a good idea to recap from the start. This tutorial will detail all the steps necessary to get the Kinect working in Mavericks, so buckle up and let’s get this party started. If you followed my earlier tutorial and/or had your Kinect running in Mac OS X 10.8 Mountain Lion, then you’ll want to complete this step before moving ahead. If you’re new, and are setting up the Kinect in Mac OS X 10.9 Mavericks from scratch then please feel free to skip this and move straight onto Step 1. When it comes to hacking the Kinect, cleaner is better. So I suggest uninstalling any existing Kinect drivers you might have installed and start fresh. If you’re confident simply upgrading then please feel free to do so, but for everyone else please begin by following the instructions in this article – How to uninstall Kinect drivers on your Mac. 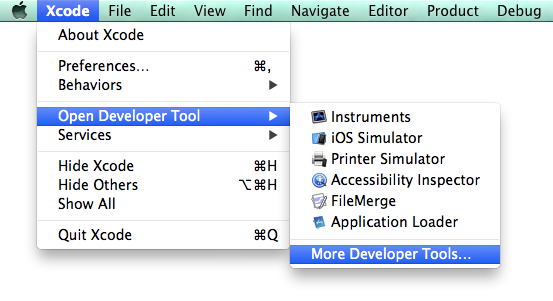 If you’re a regular visitor to this site or a developer, you may already have Xcode installed. If so, just make sure you upgrade your Command Line Tools to the latest version for Mavericks. For everyone else, please follow the tasks below. 2. Clicking this will take you to the Apple Developer website. Simply login using your Apple ID and password and continue until you see the Downloads for Apple Developers screen. 3. 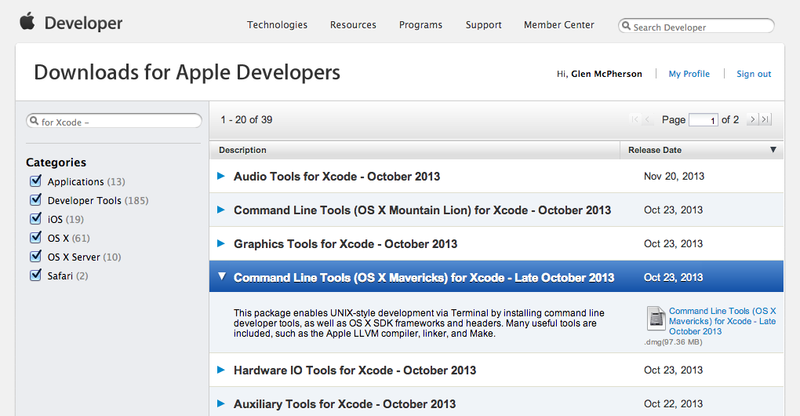 In the list of downloads, search for the most recent version of Command Line Tools (OS X Mavericks) for Xcode (as of writing, this is the release from October 23, 2013). Click on the blue disk image link to the right of the description to download. 4. Once you’ve downloaded the Command Line Tools, simply open the disk image and install the package. Easy! So now you’re up to date with Xcode, let’s move on to installing the Kinect drivers. Next up is a list of applications/tools that you’ll need to install. The versions mentioned below are the latest at the time of writing, but if there is a more recent version, you should be fine installing that too. 1. Download XQuartz, an open source version of the X.org X Window System for Mac. 2. Download CMake, a cross-platform build automation system. Select the download link beside Mac OSX 64/32-bit Universal (for Intel, Snow Leopard/10.6 or later), I’m using version 2.8.12.2. Part way through the CMake installation you’ll be asked to Install Command Line Tools, make sure you do this by clicking the Install Command Line Links button. If you get an error at this point, you’ll need to follow all the uninstallation instructions and then reinstall. 3. Download MacPorts, which allows you to compile, install and upgrade software via Terminal app. Select the download titled OS X 10.9 Mavericks, I’m using version 2.2.1. At this point you’ve installed your primary applications, so now we just need to install a couple of dependencies for later on. Don’t worry, they’re easy! 1. To install Libtool, open the Terminal application: Applications / Utilities / Terminal. ---> No broken files found. Okay, so don’t close Terminal just yet. You’ll need it for this installation too. Okay, now we’re moving into Kinect territory. OpenNi is the first Kinect-specific software you’ll be installing, so make sure you follow along closely. Please Note: Do not try to download and install OpenNi v2 beta. Unfortunately this version relies on the native Microsoft Kinect SDK, which is incompatible with the Mac. OpenNi is created by a group of companies including PrimeSense (now owned by Apple), who developed the original Microsoft Kinect. The OpenNi software itself contains a stack of middleware libraries and applications that will help get you going on your Kinect journey! 1. Create a new folder on your Mac called ‘Kinect’. This will help keep things organised (I’ll be referring to this folder later on). 2. Download OpenNI v1.5.7.10 SDK for Mac OS X. Okay, now you’re now ready to install the OpenNi SDK on your Mac. 4. Open the Terminal application on your Mac: Applications / Utilities / Terminal. We need to quickly complete this step to prevent errors during the SensorKinect installation. 1. Open Terminal on your Mac: Applications / Utilities / Terminal. SensorKinect is simply a module that helps the Kinect interact with OpenNI. You’ll need it for your Kinect to work on your Mac. 2. Once downloaded, move the SensorKinect-unstable.zip file to your Kinect folder and double-click to uncompress it. 3. Navigate to the SensorKinect093-Bin-MacOSX-v5.1.2.1.tar.bz2 file inside the Bin folder, and double-click to uncompress it. 4. Now you’re ready to install. Open Terminal on your Mac: Applications / Utilities / Terminal. It’s all downhill from here, as this is the last thing you’ll be installing. NiTE is some awesome middleware that’s made by the same crew behind OpenNI. It monitors depth, colour, infrared and audio to track your body and hands for use as input devices. Please make sure you don’t try to install NiTE v2. Just like OpenNI 2, it just doesn’t work thanks to its reliance on the Windows SDK. 1. Download NiTE v1.5.2.21 for Mac OS X. 2 Once downloaded, move the NITE-Bin-MacOSX-v1.5.2.21.tar.zip file to your Kinect folder and double-click to uncompress it. You’ve made it to the final step! All we need to do now is transfer over some files and we can test out our installation. 2. In a new finder window, locate your x64-Release folder by following this path: NiTE / Samples / Bin / x64-Release. 3. Open your Terminal app again: Applications / Utilities / Terminal. If everything is setup correctly, PointViewer should open in a new screen. This is a tracking demo, so stand back, wave your hand around in the air, and pretty soon you should notice a white tracking line appear (see the video below). The ‘Players’ demo will identify you as Player 1. 7. Want to try something cooler? Check out my other tutorial on creating special effects with Synapse Kinect and Quartz Composer. And now you should be good to go! I know a lot of you were waiting for this tutorial, so thank you for your patience and I hope it was helpful. I’ll be following this up with a few more in-depth tutorials and inspiration posts soon – to be notified when they’re published, simply sign up using the email form in the sidebar (don’t worry, no spam! ), or follow me on Twitter. I’d also love to know how you went setting up the Kinect, so feel free to comment below with any questions, success stories or issues! Take care and have fun kinecting! If you have any helpful idea… don’t hesitate. Hi Benga, thanks for following the tutorial. Can you confirm what version Kinect you’re using (the model number is located underneath the Kinect), and also check that the Kinect is correctly attached via usb to your Mac (directly), and that the AC adapter is connected to your wall power outlet? This is just some troubleshooting to help isolate the issue. If I try to start Synapse, sometimes it crashes, sometimes it starts, but when it starts, I can only see a kind of colored static noise in the viewport. That was exactly the problem, the facetime built in webcam being on for some reason interferes with synapse & the kinect and makes it really buggy (works only SOMETIMES). I turned off the webcam and everything suddenly works perfectly. Hi Carolina, that ‘niReg’ message is perfectly fine. It actually means everything is setup correctly. Hi Carolina, I’ve actually had another reader with the exact same problem. See this thread on the Mountain Lion setup article. I’m just taking a guess (because he didn’t report back), but after you’ve completed the tutorial, try unplugging your Kinect, restarting your mac and then plug it back in, making sure the Kinect is correctly attached and powered. Let me know how you go! Also, some good news – that the blinking green light is normal, and will happen when the Kinect is attached to your Mac via USB. Hey Glen, thank you so much for everything, the examples are running now and everything is working fine! Seems that the problem was the adapter, I got another one and the problem got solved. Thanks! Excellent news Carolina! So glad you got it working, and relieved there was nothing wrong with the tutorial! Ha, you had me worried. Btw for anyone else reading: I triple check (completely uninstalling and then reinstalling) these tutorials on 2 different computers and 2 different Kinects before publishing to try and minimise any issues that might arise. Hi! Thank you so much for the tutorial! Everything worked swimmingly until the very end. I’m using Kinect 1473, not 1414. I don’t know if that’s causing it. Will dig around some more, and report back. I’m having the same error as you had. Could you tell me which adapter did you buy/change it to? Thanks, I will really appreciated. Hi Glen. Great tutorial. I gave it a try and it worked at the first attempt. I just followed your tutorial and it’s working but I have a small problem: the kinect stops after 10/20 seconds every time… I just flipped the kinect to see what version I have and it’s a 1517. Do you know a quick tip to make it works with this version? (I’m on Mavericks too). Is the problem fixed or not? If not, do you think I can send the video result form a virtual machine to my mac (with syphon maybe)? 1. I just did what you said above (except for uninstalling because I had no idea on what I had done). 2. Then, checked the model number of mine, which was #1517. Frankly, I don’t know what is happening in my Mac, but it works anyway. Awesome comment Ege. I’m going to try and test this out too, and if I can replicate, then I’ll make sure to point your comment out at the start of the tutorial. Can I just ask what model Kinect you’re running? Awesome, so you’ve actually got the later model Kinect which people were sometimes having issues with. That info will come in handy to a bunch of people I’m sure. I’m trying to follow the instructions your linking to but my english is so poor I’m not sure I’m doing it right. For example, installation step 3 doesn’t make any sense to me because the directories don’t exist in the archives I uncompressed. I would be very grateful if you made a step by step tutorial for Kinect #1473 or if you could link to one. Would it be possible? Turns out Primesense’s shut down by Apple. I’ve uploaded a copy of NiTE2 and OpenNI2 here. If I hear any new hacks to improve it I’ll let you know here. Super thanks to both you geniuses! Been stuck for hours with the 2.x versions of NiTE and OpenNi. I also had my Kinect 1414 connected to a USB hub which seemed to cause some trouble. Got the same black screen that were mentioned in the previous comments. Now it works and I can begin making magic.. hopefully. Thank you again and keep up with nice tutorials. Hello, I follow the installation but I get stop at 5B.6 It doesn’t show up the next message in my terminal. I got the Kinect model 1473, is it a problem. Thanks a lot for your help. Great write-up. Everything worked the first time through. Thanks! Just wondering if I can use Homebrew instead of MacPorts in this tutorial? Furthermore, I’m wondering about a bunch of things … Can we use this to track hand gestures to control the mouse, perform clicks/swipes/drags and further interact with the operating system? I have a class for school that has a show coming up with all of the class’s student works displayed on a 60″ flatscreen. I was tasked to see if I could find some way that visitors could interact with a simple website (in full-screen mode) navigating it by simply standing there and using their hands to gesture-click buttons and swipe the screens to pan through the different projects, etc. Does this have the robustness for clicking and mouse pointing at least? This sounds pretty cool, and definitely doable. There’s a video in an earlier inspiration post that touches on what you mention. Gestural control and interaction. They’re presumably using the Processing suite to make it all work. I plan on writing a full tutorial soon (I’m currently crazy busy organising my wedding). I believe you can also get mouse motion control up and running with the TUIO drivers for Kinect and Quartz too. Hope that helps point you in the general direction you need to be heading. If you manage to get it up and running, it’d be great to hear how you went. I believe you can, however I’ve not tested this method. If you give it a shot, can you message back and tell me how you went? So I started your wonderful tutorial, then when I got down to download the Openni SDK the website is down. It looks like Apple shut it down if I am not mistaken. Is there another place to download the file? Thank you so much for all the help, and good luck with your wedding. Good luck with the tutorial, let me know if you have any other questions/issues. Do you have any idea what’s causing the problem and how could I fix it? So Helpful. Just manage the XBox 360 Kinect working on Mountain Lion. Great Guide. Thanks a lot. Hi hi! Processing is a great language that’s awesome for artists and creative types. I’m planning a few Processing tutorials soon – sign up to the newsletter if you’d like to know when they’re launched! You don’t (really) use Xcode for Kinect programming – you’re better off using Quartz Composer to make things happen. It’s great for newbies too as it has a very visual interface. Did this installation install the 64 bit versions? Do you have instructions for the 32 bit versions please? Hi Slaymantis, I didn’t actually consider this when writing the tutorial. I’ll try to take a look into it when I get a chance. If any other commenters have any ideas it’d be great to hear! Same problem here, on Yosemite the library works perfectly, but the “Kinect with OpenNI 1.5″ unity3d asset that I’m trying to use has some troubles and it seems to need a 32bit version as stated asset page (https://www.assetstore.unity3d.com/en/#!/content/7225). How can 32bit-OpenNI be installed? Items between *_* have been changed for purposes of this comment. Will the OpenNI 2.2.0.33 Beta from http://structure.io/openni works with the MAC? Just wanted to say really thank you for your efforts in every detail because I know how hard to make this kind of instructions for others. My Kinect successfully connected to my MBP without any errors. Hi Glen, thanks for the detailed tutorial. Any ideas why this might be? I’d very much appreciate any help! 1- Whats the difference between OpenNI / Nite and OpenNI2 / Nite2 ?? shouldnt we be using the latest versions ? 2- Whats going on, I see no further news from OpenNI community.. everything is at least a year old. 3- Isnt this https://github.com/totakke/homebrew-openni2 an easier way to install Kinect drivers, it even supports OpenNI2 !! There were some compatibility issues using v2 for a while. This was due to the fact that they were reliant on the Windows SDK. There are a few ways to get the Kinect interfacing on your mac, it just depends what you’d like to do with it. The tutorial above is definitely solid and tested. I’ll be experimenting with some of the other methods in the future too to test their limitations in comparison (stay tuned!). Also, this is the method I’ll be referencing/promoting for future tutorials (that allow you to create special effects and more). TL;DR – There are a few ways to get things going, but this is the one I think is the most solid and extensible atm. Awsome tutorial. Seldom You find such hight quality, thorough and well documented tutorials. Good User experience Thumbs up! I don´t know what thae problem seems to be. If you could help me it would be great. PS: I trying to install the kinect so that I could use it on Processing, so far when I run a code that uses the kinect, it says to me “no devices found”. Did you find a solution ? Would it be nice if you can share the solution . I am stuck same position now. 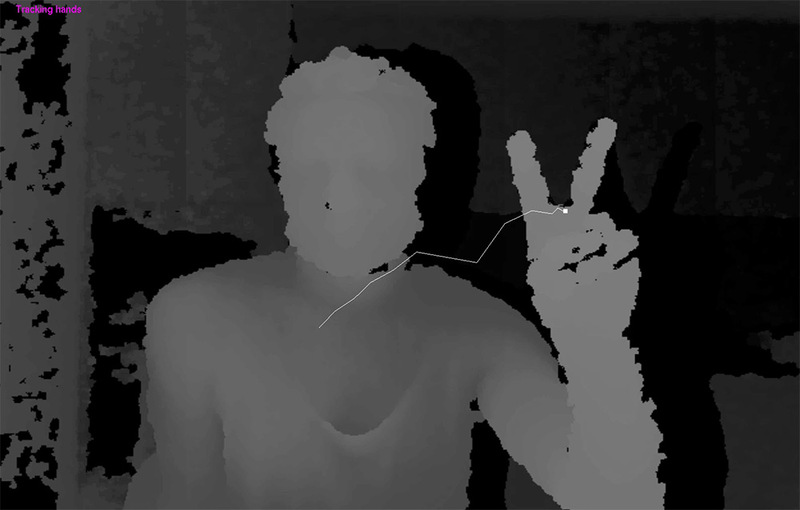 Have you try to copy instead of move those three xml documents from NITE Data to SensorKinect Data? Because that is how I solve my problem. Sorry for the late reply – can you tell me what version of OS X you are using, and also, have you previously installed any drivers for the Kinect? Im having some problems with step 4, when I drag the SDK folder from the Finder and happens the same as the video, but step 6 say: “And now the fun part! Type in the following, press Return and then enter your password to install OpenNi SDK: sudo ./install.sh”. I press Return and it doesnt ask for any password, so y just write “sudo ./install.sh” and it just say: “sudo: unable to execute ./install.sh: Operation not permitted”. Can you help me please? Really well written tutorial! Thank you for writing this up! I’ve gotten as far as Step 6, installing OpenNI, but Terminal keeps responding to “sudo ./install.sh” with “Operation not permitted”. Thanks a lot for this tutorial! Got it working the first time without any issues. I’ve googled it but i can’t find why is it happening, hope you can help me with this, thanks in advance. i really hope you can help me with this, thank you for such great tutorial. have u solved this problem? You could then download the NITE build and run demos if you want. Thanks for the link Rich, this looks great. Just keep in mind the tutorial above will help you interface your Kinect with other applications on your mac like Quartz Composer to create cool effects. I could be wrong, but it looks like Zigfu is more for in-browser apps? Love to know if you’ve had some experience – I’ll give it a whirl too. Thanks a ton for this easy-to-follow tutorial. Thanks Rick! Glad you enjoyed the tutorial and thanks for the doc links! Great stuff. We are all getting the OPERATION NOT PERMITTED error. Are you aware of this posts ? Could you please say at least if you know or do not know why is this happening ? Sorry I’ve been a little MIA lately. Can you tell me what version of OS X you are using? Also, have you installed any Kinect-related drivers before attempting this tutorial? I haven’t been able to replicate this issue, and am just trying to troubleshoot. After several hours of trial and error I successfully installed the OpenNI package and I would like to share a solution which worked for me. I used Unarchiver app (free) to unzip the tar.zip file, then right-clicked tar.bz2 file, selected ‘open with’ and then Unarchiver app again. Then I followed instructions provided by Glen (cd file_where_you_saved_file and sudo ./install.sh ) and all files installed ok. Thanks so much for the tutorial & taking the time to sort this out guys! Worked for me!!! Using Unarchiver. Thank you! Thanks for that Karolina! You may have just helped a lot of people out. I also use The Unarchiver app. So it would make sense. Just for anyone else with this issue too. Open your System Preferences (from the Apple icon in your menu bar), and then click the ‘Security & Privacy’ tab. Once in there, simply change your settings to allow apps downloaded from Anywhere. ^ wait nm i figured that out how to open it in application then security. but now im having a problem deleting it to reinstall it. please help? Hi Elliott, you can find instructions on uninstalling any of these drivers on this blog post. Thank you so, so, SO much for this thorough and effective post. After months of not being able to use the Kinect in my electronic music performances, I’ve got it up and running with Synapse again. I was getting the “The device is not connected!” message, so I bought another used 1414 Kinect at Gamestop (only $30) and all is working well. I tried to download open-ni from mega.co.nz, but the down load freeze at 99%. the same for Nite-Bin. Great tutorial. I followed the steps 1, 2, 3. That is all ok. But when I tried to download the OpenNI-Bin-Dev-MacOSX-v1.5.7.10.tar.zip, it freezed at 99%. I look for this file in the downloads folder, but it is not there. Hi Glen. Thank so much for your great tutorial. It was very helpful. But i still have a problem. I do all the stuff above without any errors or problems. And the OpenNi Samples also works perfectly. I wrote a small Java app for exercise. In this app i use the Dephtgenerator. Same code works fine on Ubuntu and Windows. But on my iMac the Depthgenerator will startsup. Thank’s for what you did it seems to be great ! By the way there is no real installation process, only dragging it to the application folder. Then I run the app and find ‘Install Command Line Links’ under the option menu ‘Tools’. Did I do something wrong ? hey every time i try and write the first bit (sudo port install libtool) it comes up with sudo: port: command not found. has anyone got a solution? I have this same problem. I try to search online, does it refer to the problem of the path of OpenNI or the macport in Mavericks??? Pretty frustrated about the Mac OS problem with Kinect……..
Got the same problem here. Apparently nothing that uses OpenGL will compile on my mavericks, because libraries were deprecated. There should be a compile flag for legacy, shouldn’t it? I’d like to start with thanking you for this useful tutorial. I made it all the way through thanks to how clear it was. When I ran the final “sudo ./Sample-PointViewer” I was pretty excited to see it run, and see some display from the kinect camera. Unfortunately it seems to crash or stop moving / gathering data after a few seconds, before even showing the point tracking and I have to force quit out of the program. It doesn’t show any error messages, but the model I am using is the #1473 do you think this might be the reason is not tracking properly / crashing ? This is such a great tutorial. Really appreciated. Thanks very much! I’m stuck at part 6. I’m getting “sudo: unable to execute ./install.sh: Operation not permitted”… Do you have any idea where the problem might be? I’m having an issue with Step 7. In a new finder window, locate your x64-Release folder by following this path: NiTE / Samples / Bin / x64-Release. Everything has installed grand as did all the folders but for some reason this isn’t coming up and for the life of me I can’t figure out why. Any idea? I have problem on step 6 when I installing NITE, i got message Registering module ‘libXnVFeatures_1_5_2.dylib’… ./install.sh: line 41: /usr/bin/niReg: Operation not permitted. HIII great tutorial, but i have a big problem here. I have MAC OS X 10.9. This only works with a Kinect sensor? The Mega download for openNI 1.5 does not work. It stalls @ 99% and then pops up a couple of ad attempts. Thank you so much for this easy to follow, clear tutorial. Worked like a charm! Hi! Just came upon this tutorial and before we give it a try, we thought we should ask if you have had a chance to run it under 10.10 Yosemite. Installed perfectly! The soft link command didn’t seem to work as it seems like the file was already in the /usr/bin. Anyways, thanks for the tutorial, VERY cool. I’m currently hoping to get it to work with Powerpoint slides. Will do some research on it but any advice? I was having the same problem as you guys with the “Operation not permitted” and was getting really frustrated..
As KAROLINA_M already pointed out I downloaded “the unarchiver” app, then I deleted EVERYTHING inside the “kinect” folder we had created and started from scratch since Step 4.. So you have to download the files and everytime you have to unzip a file do it with the unarchiver app.. And that´s it. I hope this works for everyone else too. Is it working on Kinect v2 ? As I followed along with your tutorial I ran into an error in step 4.6 “sudo ./install.sh”. I’m working in the proper folder, but I’m getting an error saying “sudo: unable to execute ./install.sh: Operation not permitted”. Any ideas/solutions? And it worked for me, hope it works for you! Everything works… for about ten seconds then the video goes black or freezes. Any ideas? Thanks your tutorial , Glen! Everything was works for me until the last step, when i launch the “./Sample-PointViewer”, the Terminal told me ” Operation not permitted”, my kinect is #1473, and i can see the kinect´s light is blinking at each second. Would be a problem that im using OS YOSEMITE?? Hi everyone! So sorry it’s been so long since an update. I’ve just recently tied the knot with my lovely wife Rachael and returned from a very long honeymoon. It’s great to see that you’ve been helping each other out in the comments section! Especially with all the compatibility issues that I wasn’t able to reproduce. I know a few of you are looking to push the boundaries and try out new things… me too! So prepare yourselves for some long overdue updates! Oh, and there are some more exciting announcements on the horizon too. I’m new on this blog and I was looking around a way to connect the new (actually not so new) kinect One to a Mac OS. anyway thanks a lot for all your support in making things working toghether. Thank you! Yes I’m actually in the same boat. I have ordered and received the new Kinect sensor for Windows (the same one the Xbox One uses, but specifically designed to work with your PC via USB). So once I get some time to test it out and get it running, I’ll put together another tutorial. I’ll also try to check and updated (if necessary) this tutorial for Mac OS X 10.10 Yosemite. Great that you’re already up and running with OSC and TUIO. If you ever want to do a guest post on either of those technologies, please feel free to let me know! If anyone is interested, I just noticed that a new PC/Tablet adapter for the Xbox One Kinect Sensor is available – Click to view/buy it for ~$49. This should let you attach the kinect that came with your new Xbox One and get the same functionality as if you had purchased the Kinect v2 sensor. has anyone got Kinect One to work with Win 7 or Mac OS X without having to use Win 7? Would greatly appreciate any leads or ideas! I have a custom built mac tower. I’ve followed some of the home-brew tutorials as well trying to get my model1414 working. I hope these installs aren’t corrupting your build. I currently have a custom built mac tower (2.99 ghz 6 core intel xeon with 24 gb of memory, zotac GeForce GT 430 1024 MB graphics card) running mavericks 10.9.5. I have a windows build on a separate solid state but i’d prefer to get this all working from the Mac side. (http://lucasmarsh.squarespace.com/kinectics/) but now neither seems to be working correctly. Perhaps the adaptor is shot. Anyhow I still can’t install the OpenNI and any help with this would be great. something is wrong with the download link. is there another place to download the file? Hello, congrats for the great tutorial! Looks like it is looking in the wrong place. There is some way to change this, so it looks in ETC paste? Hello again, i think that found something. I´m a really noob, so, i´m sorry for the basic questions. but, if you look at the website (http://packages.macports.org/libusb/) , it have just ibusb-1.0.18_0+universal.darwin_14.i386-x86_64.tbz2. This could be the problem? Oh great! I haven’t had time to fully test this in Yosemite yet. I will though and post any updates that might help people out. Glad to know this got you through though. After reading your excellent instructions and the subsequent comments I have a single simple question. After a successful installation will I be able to access the Kinect in Skype on my Mac to contact my son overseas? Thank you in advance for your attention to my question. Thank You very much. One of the best tutorial I’ve ever seen. What can I do to solve this?? Can you tell me what you did to solve this? I’m having the same issue. A recent WordPress update changed the code snippets on this site. I’ve fixed everything now! Try the tutorial again and you shouldn’t have the same issues. My apologies, I didn’t realise that a wordpress update destroyed my code snippets. I’ve updated everything now, so the tutorial is working again. Please take a run through and let me know how you go. Thanks for your excellent tutorial and for responding to so many comments Glen. Maybe this is a really dumb question, but I’m not sure I understand why one would need to go through this installation process? I’ve been using a Kinect successfully on Lion and Yosemite without ever installing any kinect drivers – just NIMate or Synapse. I found this tutorial after I started having problems getting a Processing sketch to work on Yosemite. It works fine on Lion, but on 10.10 the OpenNI library is not found, even though it is installed in the right place. I read that since mid 2014, OpenNI is no longer supported, so that may explain why it won’t work on 10.10. Developing anything new using OpenNI seems a bit risky, and sadly it seems Windows is the safest platform. Hi Toni, Thanks for visiting and for the info. NIMate will definitely get you up and running without the hassle, but unfortunately it’s a paid alternative. Installing the drivers is recommended when attempting to use the Kinect with Synapse and Quartz Composer, and should let you hack into it for most other purposes too. If you intend to write professional software using the kinect as an interface, then I would definitely go custom or a solution that has a higher level of support than OpenNI. But for the tehnologists, makers and hobbyists, this should be a nice way to get started. I do intend to get a tutorial up with the changes for Mac 10.10 Yosemite, along with a tutorial for the Kinect v2, but it’s been hard to find the time as I’m also launching ‘Creature Lab’, my new UX and design innovation studio (sign up to the eNewsletter to hear when it launches). I should have some free time over the next month though, so stay tuned for more Kinect fun. Apologies, there was an issue with this website that affected the code snippets. This has been fixed, and the tutorial now has all the correct code for you to copy/paste. Please let me know how you go! Hey Glenn, 1st things 1st: Congrats on your excellent work and thnx 4 sharing ur worthy knowhow. anyone could help I’d appreciate it…. How did Andres solve it in the end????? can´t wait to finish this setup and play with my interactive sets now on kinect…. thanks really 4 the time and patience, excellent project! My apologies, it seems a wordpress update destroyed the code snippets I posted. The ‘stag code’ reference you were seeing was not meant to be there at all. I’ve gone through this entire post and replaced all the code samples to fix the problem. You can now hover your mouse over the code snippets too and it’ll let you easily copy them as plain text – ready for pasting. In a nutshell: There were issues with the tutorial that are now fixed. Please let me know if you run into any more issues! It worked for me the first time I tried so all is good. I’m going to try the other demos. Thanks a lot for the fun! Very clear tutorial, thanks a lot! does it work on yosemite? Hi Glen, great tutorial…I followed it and worked first time..do you have any links to use the kinect for facial tracking on maverick? Amazing tutorial, everything highly detailed, never got lost, not even a single error. Thanks a looot! Help please!! I´m very close!! Can anyone suggest a fix? Any insight in to what might be the problem? The issue is that OS X by default puts a ‘quarantine’ label on downloaded files it doesn’t trust. Normally, if this is the case with a ApplicationName.app file, you would doubleclick the file, get a warning from the system, click “Open” and it removes the label. This is a bit different with these binaries or shell scripts. – instead of typing “sudo ./install.sh” I used “sudo sh ./install.sh”, which goes around the blocked install.sh because it’s not directly executing that file, but the “sh” program instead, which then reads install.sh as a regular file. Nevertheless, this still got me 3 errors on executing “niReg” (operation not permitted). Unfortunately I’m encountering a problem in step 4, at point 6. 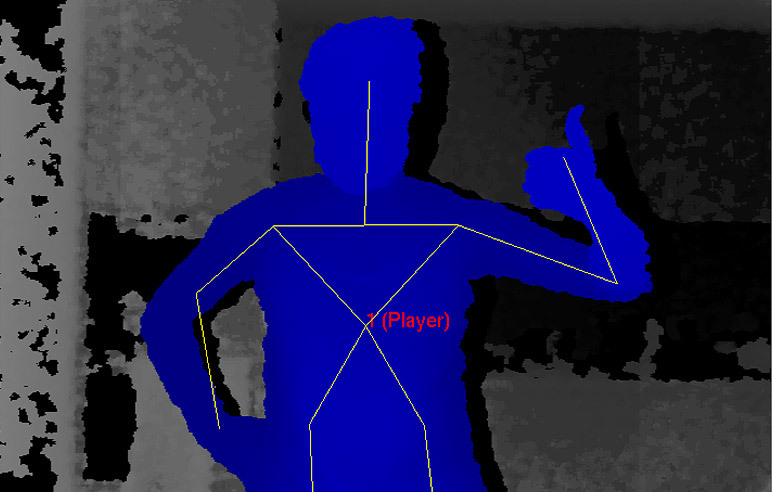 Have nice experiments with kinect ! I successed all of them. But, when I play Samples of NiTE it works during only few seconds, and it stops. I wonder why it does that. I installed “XQuartz-2.7.7″,”cmake-3.2.1-Darwin-universal”(It was for 32bit but I followed your tutorial said that word ‘universal’.. maybe, am I wrong? ), “MacPorts-2.3.3-10.9″. and other installers were in your instructions. My OSX version is 10.9.5. Am I wrong something in your instructions? I’ve got the same problem, my Sample-PointViewer program will run for between 20 and 21 seconds and then will display a black screen. I’ve tried running other sample programs and gotten the same result. Somewhere at or before the 20 second mark, the programs become unresponsive. Is this a problem with the Hardware or the Software? That really help me a lot! I had difficulty initially but in the end I installed Yosemite onto my mac and the installation worked like a dream. Thanks you. I’m running Yosemite now too, and my installation appears to have worked fine, but exactly 20 seconds (tested and timed many many times) after I run the Sample-PointViewer program, it freezes up. The screen continues to display “Tracking Hands,” but the screen goes black and doesn’t appear to register anything. If I quit the program and run it again, it works fine, but again, only for 20 seconds. This is an amazing tutorial. Thank you for not skipping small details. It worked smoothly. Just wanted to say thank you. Your tutorial is spot on, and worked the first time. I was up and running in less than 20 minutes. Many thanks for such a clear tutorial and the software! It’s because your files weren’t copied correctly during Step 7. I believe the files must be located in both folders, so make sure there are copies in both. It works well!! I’m using Yosemite. Thanks a lot, Glen! Works like a charm on my 10.10.3 Air with Kinect for Xbox 360! Thanks a lot for the really easy to follow guide! Just wondering if the OpenNi v.2.2.0.33 beta still doesn’t work on osx: http://structure.io/openni. So I have gone through all the steps no muss no fuss, but when I try to run the last terminal command, terminal says “file not found!”. I am running OS X Yosemite. Such a helpful walk-through of installation. Thank you, very much! I scrolled through and saw that someone else had this problem and maybe I just missed the answer but if someone could throw be a bone here I’d really appreciate it. problem solved … I forgot that Sudo sh install.sh works instead…. THANK YOU for posting that. I’m new to all this and could not figure out how to solve the “not permitted” issue. you’re “oh yeah!” moment just helped a newbie out. How should I do about this, I wanna learn the solution about this problem. just in case anybody runs into a problem installing the command line tools for CMake… this guys video has the solution you’ll need. A library relies on native code that’s not available. Or only works properly when the sketch is run as a 32-bit application. I saw a similar issue in the comments but the proposed solution didn’t solve the problem. Can you please advise? Any help is greatly appreciated. I’m not that fluent with these things but it seems like all the preceding steps executed smoothly except I did notice that I was never prompted for my password when in the terminal while installing sensor kinect or NiTE. Very nice tutorial, Glen! Thank you! In spite of restarting my MacBook Air several times and plugging and unplugging Kinect for XBOX360 (Device no 1414) , my attempts to run the sample games always result in the following. Could Glen or anyone else help me with this one? Is there anywhere else i can download the NITE-Bin-Dev-MacOSX-v1.5.2.21.zip file from? Error: org.macports.extract for port autoconf returned: Failed to locate ‘xz’ in path: ‘/opt/local/bin:/opt/local/sbin:/bin:/sbin:/usr/bin:/usr/sbin’ or at its MacPorts configuration time location, did you move it? Hello Glen! Thank u so much for this amazing step by step tutuorial! Just one question are there any changes if I work with Yosimete? I’ve followed all the instructions. When I did this a few months ago on my imac, everything worked as expected the first time, no errors. Now, on my Mbp, I cannot get past step 6. I type sudo ./install.sh and nothing happens.i.e no feedback from terminal. When I try sudo sh ./install.sh I am prompted to enter my admin password. Once this is done, nothing happens and terminal gives no feedback again. I am on Yosemite 10.10.5 on this mbp. Please help me, i have a deadline in a week and I am really badly stuck. I get stuck at step 4 part 6 where I am supposed to install openNI. Terminal displays no feedback when O drag the folder in and press return. Decided to skip this step and see if I go ahead and install SensorKinect and Nite. Both of these seemed to install fine. What I am doing now is, uninstalling and starting again. I am on Yosemite 10.10.5 using a 1414 Kinect on an Mbp mid 2014. If anybody can help that would be great, I have a project due in a week and it isn’t looking good. I have read through all of the comments and tried all the suggestions but no luck so far. If you or anybody can offer some assistance that would be super cool. I managed to get everything working! I restarted my laptop and went through the uninstall process. Restarted again and then followed the tutorial from the start. This time everything just worked, no errors, no anomalies. I guest was a user error. I double checked that i was using the correct files and instead of copying and pasting the code snippets from the tutorial, I carefully typed them into terminal. I am running Yosemite OS X version 10.10.5 on a mid 2014 Macbook Pro Retina using the 1414 kinect. This is a great tutorial and it is worth sticking with it as it will work well in my experience. Hi. How did u managed that? Could you help me please? Im in the exactly same problem with yosemite. Thanks for the terrific tutorial! Unfortunately, although everything installed without error, I can’t connect to the Kinect. It works fine in Processing (with examples here: http://shiffman.net/p5/kinect), so I know that the hardware is set up correctly. I’m on 10.5.5 with an XBOX One 1520. Does any Kinect work? Or do I have to get a special one? This is exactly what I needed — but then I still couldn’t get it going. I got the same errors as someone else did where the XML file thru an error and the USB device failed to load. Turns out that my MacPro (aka Trashcan) only has USB 3.0 ports. When I hooked up the Kinect to one of the USB outs on my Thunderbolt display: viola! Working great so far on El Capitan. Thanks, GLEN for the awesome write up, too! I have a whole host of old projects that will see life again now, thanks to you! Congratulations on your tutorial. I’ve been used to Montan Laion Yosemite and with much success . Thanks . But now with Captain trying to install OpenNi , NITE … The Terminal tells me that I do not have permission . You know something about these last changes? Thanks, I forgive my ingles and the googletranslate . so i don’t know much about any kind of coding or programming, and when i mean much I mean barely, but the Libusb: A usb support tool for applications. section I am receiving an error and don’t know how to fix it. Also when I click the link for the openNi SNK nothing is available. so I am not sure where to look for what is needed. Oh i forgot to mention what I am using….I am using a Mac from about 2010 and have updated software of El Captain. can anyone help me please to download nite as i tried all links but all of them was empty . Hi Danial, apologies – the link must have gone down. I’ve replaced all the links in the page with new ones. You can also download here. can anyone help me please i did all the steps successfully but when i do the player sample and point viewer sample after it show me what it must but after few second the showing window stock would you please tell me what is wrong and what is solution. Thanks for any help. Just updated to El Capitan yesterday. Thanks for this! I’m having trouble getting the Kinect to come on though. The green light keeps blinking and then finally goes off. Also, I can’t seem to get Synapse to run either… it keeps quitting on me. I’m using OSX Yosemite. Any advice is much appreciated. Thanks! Thing is, I followed the steps, and tried to run the software, and I got a message in the terminal that stated that the device is not connected. It is connected, everything is plugged in properly. A link to the program download is also on that website. I can’t seem to get the kinect to work at all, and I desperately need to get this program working. Any help you can provide would be greatly appreciated. Thank you, Glen for this great post! Managed to get the kinect 1414 working on sip off el capitan with this awesome tutorial. How do I give permission for the Operation? this will allow compilation/install of “quarantined” files. Thank you for the detailed tutorial. It is working on El Capitan also. I ran into a new security feature that did not allow the install. I had to do was to disable the new System Integrity Protection. 1. Reboot Mac in recovery mode by pressing Option-R while booting. I was trying to install the kinect on an OSX el capitan and I was getting the same error. This was my solution. Restart the machine and hold cmd+r to boot into recovery OS. Once there select the terminal and Enter “csrutil disable”. and Enter “reboot” after. Once your mac starts cd into the OPENNi and type sudo sh ./install.sh this should work. For safety after you’re done installing you can reenable the csrutil. I hope it works for you’all. Hi Glenn, Thanks so much for this! Could you tell me how I can use the microphone of my kinect? Do you have a set up for OSX 10.12 (el captain) ?? It’s Feb 1, 2016. I’m not sure if you’re still responding to this post, looks like the most recent posts were two months ago. I believe that I followed all your directions correctly and all seems well. I’m on a newer Mac Pro and the Kinect is recognized at the USB 3.0 Bus. But the final command for the PointViewer did not work, nor does the Kinect seem to be responding. I have model 1520 for XBox 1. I am a college professor working on gestural interaction for live performance, but an orchestra director with some background in computer programming, but not an expert. Any help much appreciated. It would be fine to respond to this email address. Hi Forrest, I also have the new Mac Pro and I have the problem “Device: PrimeSense/SensorKinect/5.1.2.1: The device is not connected!” . I guess it is the USB 3.0 problem, if you read the comment from @ MINTYQUINTY, he got it worked on the Thunderbolt display. Do you have any luck since you posted? I will try to get a thunderbolt usb hub and see if it works. First of all I want to thank you for your tutorial ! It have installed me some kinect’s drivers. I want to restart whith a clean setting. Is it enough if I put what was installed into the trash ? Is there no hidden files ? Is there a way to connect a Kinect One sensor to Mac? Thanks for this tutorial. This works perfectly without a hitch on El Capitan with a 1414 Kinect! Thanks for this awesome tutorial!! This would have taken me actual years! Whenever i put in sudo port install libtool, it keeps saying that it is not found can you please help thank you. Hi there. anyone has any idea on how to get this working on osx el capitano? hey @HANNES, did you or someone tried if it works on 10.11 El Capitan? I would like to config my setup to code with openframeworks. Error: org.macports.activate for port libusb returned: Image error: /opt/local/lib/libusb-1.0.0.dylib already exists and does not belong to a registered port. Unable to activate port libusb. Use ‘port -f activate libusb’ to force the activation. Why? What should i do? Does this work on El Captain? Dear Friends I am desperate i want to use the kinect device on my macbook pro with yosemite 10.10 and its impossible to access the kinect camera using the technique here. Although everything seems to be installed fine during the process , when i reach this point the kinect just doesnt connect. I am a university student i need to use this desperately for a project . I would be grateful if you could help out guys !!! I have issues as well with my 10.10. Could you solve it finally somehow? Hi Glenn, im gettin an error to install the libraries, the sudo wont permit install some of them, i got an error that shows the message Operation not permitted, do you have a clue of how could i fix it? Does this allow you to use the Kinect with the mac version of Skanect? My goal is to be making 3d scans. Thanks. thanks a lot for your tutorial. It’s great ! Hi. I have mac os x 10.10. I’ve tried to install the libtool but after typing “sudo port install libtool” it sais “Port libtool not found”. I couldn’t find a solution. Can you help me? I got stucked on Step 4. When I entered ‘sudo ./install.sh’, the error messages appeared. How can I fix this? Please help me. Thank you so much Glen, worked like a charm. Hello Glen, I used the unarchiver method and this same thing happened. It automatically says sorry try again. Ive gone through many tutorials and libraries trying to get this to work. Thank you for the tutorial! we need to modify the installation path in all the install.sh from “/usr/” to “/usr/local/” due to SIP. Great tutorial. Up and running in minutes on Yosemite! All this gonna work ?? i have to download the same versions for applications as you did or the latest versions ?? Hi Glen, thanks for the effort making this helpful tutorial. I have Kinect v2 (1520) and Siera OS, do you think will it also work if I follow same step on your tutorial. On Mac OS X El Capitan and newer we need to modify the installation path in all the install.sh from “/usr/” to “/usr/local/” due to SIP.